When compared to vitamin pills, liquid multivitamin have a high absorption rate since they are made up of already dissolved nutrients. Plus, they are easier to take as opposed to swallowing large sized tablets or capsules. Listed below are some of the best liquid vitamins which can be used to improve overall body health. The first product among the best liquid vitamins is Vital Earth Minerals Super Liquid Vitamins. 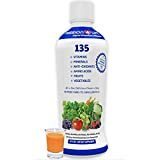 The best thing about this product is that it tastes great and contains 16 different vitamins including both fruits and greens which provide energy and has a fulvic mineral base. The liquid multivitamin product is suitable for all and is gluten-free. There are no artificial sweeteners, no soy, dairy or crystalline fructose. This formula makes you feel energetic and improves concentration levels. It also helps in the management of weight control and blood sugar levels. An overall body improvement is a result of taking this liquid vitamin supplement which also repairs tissues and aids in their growth. The next product on the best liquid vitamin list is Men’s Mega Premium Multivitamin. This product is created especially for men using herbs, minerals, amino acids and vitamins that help provide an active lifestyle and make you feel young. The liquid multivitamin product also contains Saw Palmetto which is good for prostate health. It is free from artificial flavoring and colors. This liquid vitamin supplement is easily absorbed by the body and has double the vitamin D value needed by men. Micronutrients required for optimal health are also included in this product. Tropical Oasis also has a liquid vitamin catering to women. This product is made especially for women and provides all the nutrients required to keep you active and young. There are 16 herbs as well as superfoods used in this formula that are good for the skin, provide energy, help reduce menstrual pains and also lower stress levels. The product has been formulated based Dong Quai which has been part of Traditional Chinese Medicine for hundreds of years and is effective in curing irregular menses. Besides this, the liquid multivitamin product also consists of ingredients that boost the immune system and help in anti-aging. There are no artificial flavors or coloring used in this supplement. One other vitamin on the best liquid vitamin list is Liquid Morning Multivitamin. The product is suitable for both men and women and developed by renowned nutritionist and health educator MaryRuth. The multivitamin product provides all necessary vitamins required for good body health and is easy to digest. The liquid formula is gluten and dairy free and rejuvenates the body making you feel energetic. This liquid multivitamin supplement contains ingredients that are certified and are all organic. It can be mixed in smoothies and other drinks. Customers who have used the product saw an increase in energy levels and improved blood tests. Organic Life Vitamins also features on the best liquid vitamins list. It contains a blend of 24 organic fruits and vegetables. 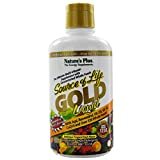 The vitamin part of this liquid formula also contains certified organic products that boost metabolism, improve prostate health, make bones healthy and provide the daily energy required. This product is easy to ingest and contains sources such as amino acids and organic flavors that aid in absorption. Improved energy levels are noticeable after using this multivitamin supplement along with improved nervous functioning. 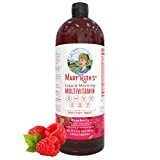 This liquid multivitamin can be taken with different shakes and liquids. Advanced Liquid Multivitamin is also part of the best liquid multivitamin list. This product contains various nutrients necessary for a healthy body system. From heart and vision health to digestive and circulatory support, this formula contains all necessary ingredients to provide optimal nutrition in a bottle. It is a fine blend of 10 vegetables, 29 fruit concentrates or extracts and 12 herbal and spice extracts. All this nutrition is paired up with red wine and grape extracts with resveratrol, sea vegetables, folic acid and chelated minerals. This liquid multivitamin supplement cures vitamin deficiencies and contains vegetables and fruits to provide nutritional requirement. The product is FDA approved, made in the USA and is GMO-free. This delicious tropical fruit flavor multivitamin provides improved body health which makes it part of the best liquid vitamins list. This product contains high potency vitamins and whole foods that are important for healthy body growth. 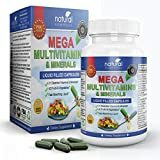 Vitamins A, C, D3, K2, and B12 are some of the vitamins used in this product that can help deal with deficiencies and provide the nutrition required. This liquid vitamin formula helps fight aging and provides energy to make you feel rejuvenated. With that, the liquid multivitamin supplement is also suitable for controlling blood sugar levels. This product provides a complete diet necessary for proper body growth which makes it one of the best liquid vitamins. The formula used to create this product contains high potency vitamins and high absorption calcium. It is a suitable liquid multivitamin for men, women and children alike. The use of this product results in a better cardiovascular and immune system. Reviva also helps in the growth of strong bones and prevention of osteoporosis. The proper nutrients that are a requirement for the body are all met with this high potency formula. Customers who have used this product have talked about how energetic they felt after using this liquid multivitamin supplement. For best results it is important that the product is consumed daily or as directed by a doctor. This multipurpose liquid vitamin is easy to ingest and holds multiple benefits which makes it one of the best liquid vitamins. It is suitable for everyone, including athletes, trainers, adults, seniors and kids. Using this product regularly results in increased focus, improved stamina, and reduced stress levels. It also provides many beauty benefits, supports antiaging and improves overall body systems. This liquid vitamin supplement is suitable for people of all ages and contains natural wholefood ingredients important for improved body health. No sugar, preservatives or artificial flavors are used in the product. Customers who have used this liquid multivitamin have been satisfied by the results achieved. Mega Multivitamin and Minerals is the final product on the best liquid vitamin list. These are liquid filled capsules that are easy to ingest as compared to regular tablets. This product is suitable for both men and women and contains 21 minerals required for good body health. Fruits and vegetables are also used as ingredients in this supplement necessary to provide good health and boost immunity. A money back guarantee is provided if consumers aren’t satisfied with the product. Customers who have used the liquid vitamins product have seen quick results within a short time. These are some of the best liquid vitamins available in the market formulated to provide maximum benefits. All of these can help deal with deficiencies, improve mental and physical health. Most vitamins prevent aging and others provide beauty benefits. These liquid multivitamin supplements contain wholefoods and most are gluten-free which makes them more effective.